I’m sneaking the second post in my series of a gluten/dairy free pie of the month in just under the wire- February was here and gone in a flash for me. When I was planning out my GFDFPOTM posts, February was a no-brainer. 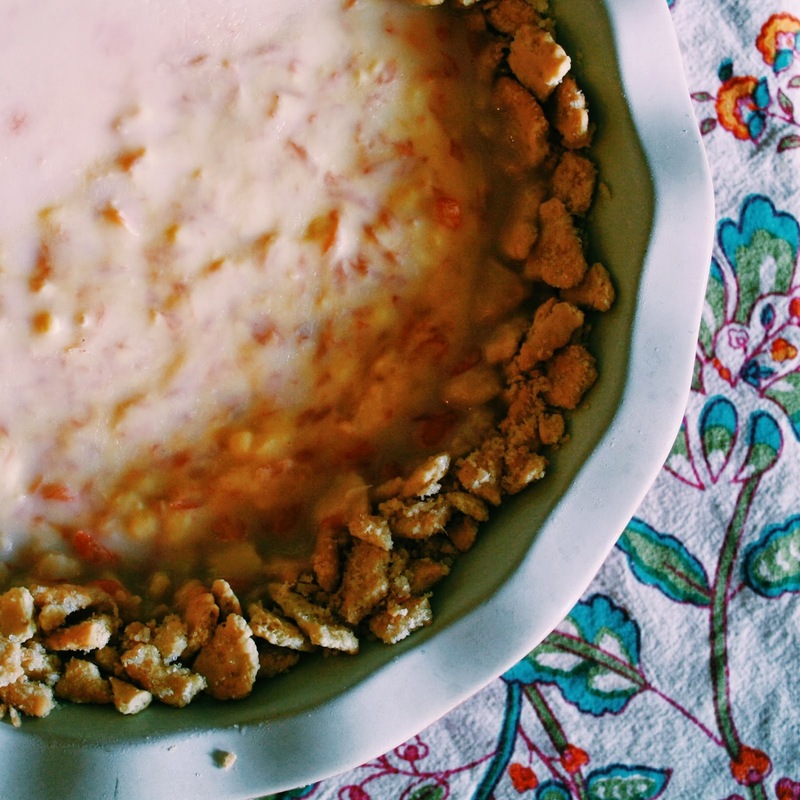 It had to be a take on Christina Tosi’s famous Grapefruit Pie. Two of my favorite food52 bloggers have raved about this pie, and we’ve got tons of beautiful and local grapefruit in February, so I was determined to try to make a gluten and dairy free version. But man alive, those ingredients were against me from the start! A crust made of ritz crackers, butter, and milk powder, a buttery passion fruit curd filling, and a topping made from condensed milk- so much dairy! So I’m going to tell you the changes that I made, but before that I’m going to tell you that they weren’t all successful. (A copy of the original recipe is here). The grapefruit-y part of this pie, a beautiful passion fruit curd with hundreds of grapefruit threads suspended in it, was outstanding, and quite simple to make GF/DF- I just had to sub coconut oil for butter in the curd. (Heads up for any central Texas folks attempting this pie- you can find passion fruit puree in the freezer section of Fiesta, but not by the ice cream- it was on the other side of the store closer to the Jewish foods. Central Market didn’t have it). For the crust, I picked out the most ritz-looking gluten free crackers I could find (a plain Glutino variety), subbed coconut oil for the butter, and shredded unsweetened coconut for the milk powder. The crackers tasted pretty terrible on their own, but mixed with fat and sugar they were (unsurprisingly) improved! I baked the crust as directed in the original recipe, and it didn’t really brown, but did turn into a crunchy crust, so huzzah! The topping in the original pie is a sweetened condensed milk mixed with citric acid to thicken it (citric acid is surprisingly easy to find- I’ve seen it in bulk at Wheatsville and I bought a small bag at the Savory Spice Shop). In lieu of condensed milk I emptied a can of coconut milk into a small pan, added 1/4 cup of sugar, and cooked it on low until it had reduced to 3/4 of a cup. While it looked thicker, it was no where near as thick as regular sweetened condensed milk and the citric acid did nothing to thicken it, and instead only made an under-sweetened condensed milk unacceptably sour. This layer is supposed to have red food coloring added too, which I omitted because I don’t like food dyes. The original recipe says that this pie is supposed to be frozen. I’ve got one of those side-by-side refrigerator/freezers and the damn thing is not wide enough to accommodate my pie plate! So I tilted the pie and stuck it in slant-ways. Naturally, since the topping was under-thickened anyway it all pooled on one side and froze that way, which explains why my picture of the pie at the top of this post is cropped so oddly and why you don’t see a lovely smooth pink layer on top. Whew! As for the taste: The grapefruit/passion fruit layer is outstanding- Henry and Andy and I enjoyed swiping tastes from the emptied blender jar, and the technique for separating all those little grapefruit segments into their individual threads is so fun (you just heat them gently in a teaspoon of oil! )- I’m thinking of other things I can fold little citrus bits into. But the crust and the topping were really not worth replicating. I’m sure the crust made with real ritz crackers is sublime, but I just don’t think it was worth the added work and expense with GF crackers. And the topping just didn’t work at all when made dairy free. So for this recipe I have decided to write it up how I will cook this pie next time, with my favorite coconut crust (it’s paleo!) and with a whipped coconut cream on top instead of the condensed milk/citric acid layer. Finally, I really preferred this pie just chilled, not frozen. The curd was so smooth and dreamy when it was cold, and I thought it was just a bit too hard and icy when frozen, so I won’t serve it that way again.With these changes, this is a pie I’d be happy to make again and again. 1. For the crust: Preheat the oven to 350 degrees. Combine the coconut flour, almond meal, shredded coconut, coconut sugar, and salt in a medium bowl. Stir in the melted coconut milk and mix well so that every bit is coated. Dump the crumbs into a 9″ pie plate and press evenly up the sides and bottom of the pan with your fingers. Bake the crust until golden brown, around 20 minutes, and then remove and cool completely. 2. For the filling: Put the passion fruit puree and sugar into a blender and blend until the sugar has dissolved. Add the egg and blend on low until the mixture is smooth and bright orange-yellow. Pour the mixture into a medium saucepan and clean the blender canister. Bloom the gelatin in 2 tablespoons of cold water. Heat the passion fruit mixture over low heat, whisking regularly as it thickens. Once it starts to boil, transfer back to the blender (note: mine never boiled but seemed thick so I continued with the recipe- it turned out fine). Add the bloomed gelatin, coconut oil, and salt, and beat until the mixture is super-smooth. Transfer to a container and chill in the fridge until completely cool. While it’s cooling, remove the rind of the grapefruit completely, leaving no white pith behind. Then carefully remove each segment of grapefruit from its membrane by slicing down both sides of each segment along the membrane to the center of the fruit; the segments should come right out. In a small saucepan, heat the teaspoon of oil and grapefruit on low heat, stirring occasionally. After about 2 minutes, the warm oil will help separate and encapsulate the individual grapefruit ‘threads’. Remove from heat and let the threads cool slightly before proceeding. Using a spoon or rubber spatula, gently stir the grapefruit threads into the cooled passion fruit curd. Spread the chilled grapefruit and passion fruit curd evenly over the cooled crust. 3. For the topping: Carefully scoop the solid white fat from the top of the chilled coconut milk can into a small bowl (it’s ok if some of the liquid-y part makes it into the bowl too- this happens to me every time and it still whips beautifully) Add the sugar and vanilla and beat until the coconut fat is fluffy and whipped cream-like. 4. Finish the pie: Spread the whipped coconut cream on top of the grapefruit curd and eat immediately or refrigerate until you’re ready!